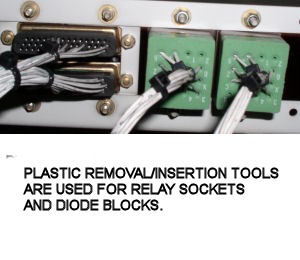 Terminal strips are similar to rear release and rack plugs, the pins are removed with the plastic removal/insertion tools. The tools are made by Amp® and Deutsch®. 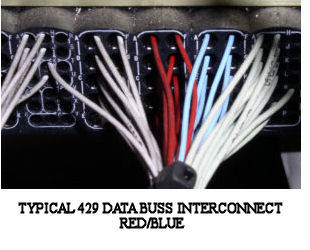 The standard terminal pin sizes are blue, red, and green. All removal/insertion tools are color coded for pin size. The white side is used for removal. The colored side is for insertion. Deutsch tools are cylindrical at the midpoint. Amp's have a square shape. One major hassle with removal tools is placing the wire "in the tool". If the wire length is available, it can be "walked in" from the gap further back on the tool body. Terminal strip pins are hidden. Removal tool color is usually based on wire size. A trial and error method must sometimes be used to find the correct tool. A proper fit is "felt" with the fingers. If the proper tool is not used or if it is not fully seated, the locking tabs for the pin will not release it. There are many occurrences in which one type of tool works better than the other. If an Amp tool doesn't seem to work, better luck may be found with a Deutsch. Plastic extraction tools cannot be rotated left/right after placement in the strip. If a good seat is not made, remove the tool and re-position before inserting again. If a tool is rotated, it will break. If any pieces are left in the terminal strip that cannot be removed, the whole strip will need to be rejected. Any stray plastic pieces will prevent a tool from seating and the tabs will remain engaged. 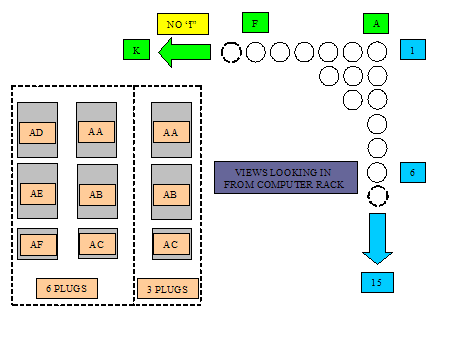 Unused positions of a terminal strip will not have pins. If a pin is installed without a wire attached, there is no means of removal. Terminal strips usually have little resistance to pin insertion. A click will be felt when the tabs engage. A slight tug on the wire will verify the pin is locked. Each terminal strip block can have numerous configurations. 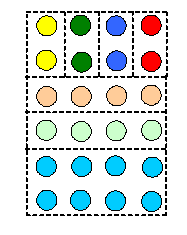 A block can have pin connections for 2, 3, 4, 6, and 8+ interconnects. Some blocks join all the pins together. 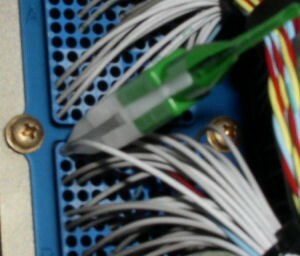 A white outline box is usually used to identify pin connections. Rack plugs use locking tabs for pin retention. 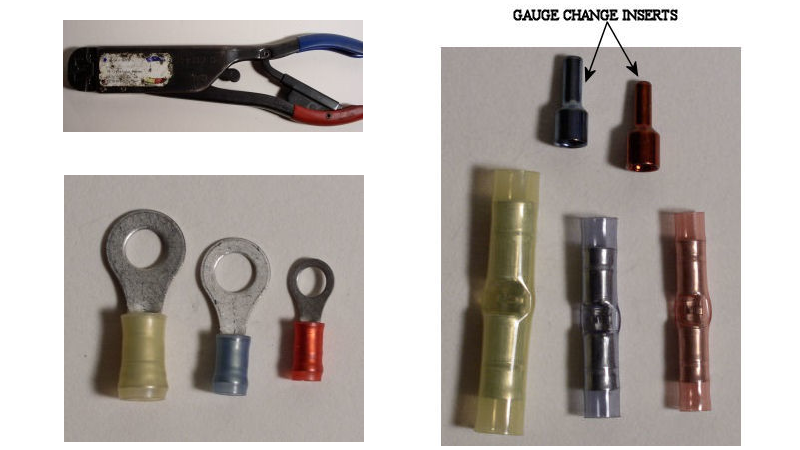 The plastic removal/insertion tools can be used in the majority of applications for pin removal. Both sides (front/rear) of the plug are constructed with hard plastic. 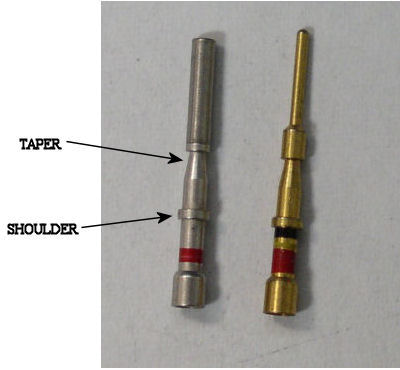 There is normally very little resistance to tool insertion and the pins are easily released. The most common difficulty with rack plugs is getting a clear view and straight shot at the back of the plug. Some radio racks require extensive dismantling for plug access. Identifying and removing pins is also hampered by the wiring going to the plug. A large wire bundle will require to be "opened up" to gain access to the plug's inner pins. All removal/insertion tools are color coded for pin size. The white side is used for removal. The colored side is for insertion. 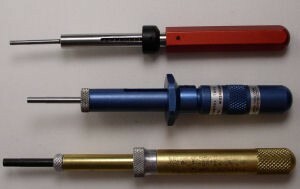 Deutsch® tools are cylindrical at the midpoint. Amp® tools have a square shape. There are many occurrences in which one type of tool works better than the other. If an Amp tool doesn’t seem to work, better luck may be found with a Deutsch. I have found the Amp tools work very well for most plugs. Rack plugs usually have little resistance to pin insertion. If a pin has a wire attached, the wire is normally all that is needed for insertion. A click will be felt when the tabs engage. A slight tug on the wire will verify the pin is locked. Blank pins need the tool to be inserted. Computer racks have two, four, or six high density plugs. 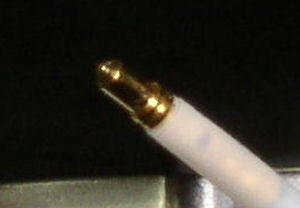 It is common to find numerous signal wire pairs in these plugs. Signal wires are twisted pair/trip with a shield. The wires are red/blue or red/blue/yellow. Careful attention needs to be placed on pin identification. Each plug has 150 pins; it is very easy to access the wrong pin. The AMP® green/white plastic tool works well on these plugs. The pins are male. When fully inserted in the plug, each pin is enclosed in a cylindrical socket. The computer has female pins that fit around the male and into the socket. Safety wire should not be used as a makeshift test lead on these pins. If a pin is not in alignment, it will be shoved back, breaking the locking tabs when the computer is placed in the rack. The standard ranges of pin sizes are red, blue, and yellow. Red pins for gauges 18-22 receive the majority of use. The most common purpose is for signal wires. The larger blue and yellow pins are found for power functions. It is not uncommon to find intermixing of pin sizes in the same plug. Plastic or metal insertion/extraction tools are required to work on rear release pins. The tools are made by Amp® and Deutsch®. Both manufacture's plugs are used extensively throughout aircraft avionics/electrical systems. One major hassle with removal tools is placing the wire “in the tool”. If the wire length is available, it can be “walked in” from the gap further back on the tool body. A considerable amount of skill is needed to remove pins from some rear release plugs. The main problem is seating the tool fully around the pin shoulder. As with front release, if the tool is not fully seated the tabs will not release and the pin cannot be removed. There are many occurrences in which one type of tool works better than the other. If an Amp tool doesn’t seem to work, better luck may be found with a Deutsch. The majority of the time the tool will stop at the pin base. It can be tilted along the length to help get over the base. A good seat can be "felt" with your fingertips. Plastic extraction tools cannot be rotated left/right after placement in plug. If a good seat is not made, remove the tool and reposition before inserting again. If a tool is rotated, it will break. If any pieces are left in the plug that cannot be removed, the whole plug will need to be rejected. Any stray plastic pieces will prevent a tool from seating and the tabs will remain engaged. I will use the metal tools as a last resort. The metal tools shown here along with the tweezers type can easily damage the locking tabs if they are not used properly. Female pins without wires can be assisted out of the plug with a paper clip or stick pin from the front side. The push rod from a front removal tool is helpful with male pin removal. The rod tip is concave, it can push the pin up enough to grab the base from the backside (fingers only, do not use pliers). 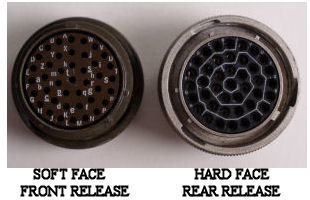 Rear release plugs usually have little resistance to pin insertion. If a pin has a wire attached, the wire is normally all that is needed for insertion. A click will be felt when the tabs engage. A slight tug on the wire will verify the pin is locked. Blank pins need the tool to be inserted. All plugs that use letters for pin identification do not use “I”, “O”, or "Q". Plugs that use numbers for identification will have parentheses “( )” around every tenth digit. Plug replacement requires extreme care. Any mismatch of pins can be cause for headaches when trying to verify the mistakes. I do not follow the letters or numbers around the plug. Most plugs will have the pins aligned in rows. It is much easier to start at one edge and do one row at a time. This prevents problems near the end of the plug change, trying to stab pins into the middle with wires all around. Each pin needs to be double, and then triple checked before moving on to the next one. Placing pins in the unused positions will help the “next guy down the line”. If a pin is needed but not available in the shop, a spare can be used from the plug itself. A quick visual of the front face is all that is needed to differentiate between the two. Front release will have rubber on the face and rear release will have a hard plastic material. Front release pins have a noticeable taper in diameter that starts after the shoulder. The standard ranges of pin sizes are red, blue, and yellow. Red pins for gauges 18-22 receive the majority of use. The most common purpose is for signal wires. The larger blue and yellow pins are found for power functions. 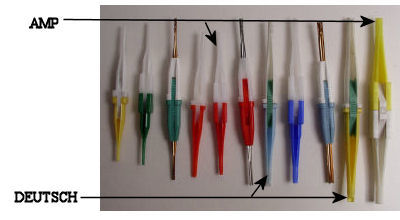 It is not uncommon to find intermixing of pin sizes in the same plug. Selection of the proper tool color is an easy task. The pin diameter will dictate which color to use. The possibility of a mistake is slim. When the tool is placed around the pin the fit should be snug. The tool should be inserted and fully seated around the pin. A definite stop will be felt. Pin push tools can be rotated left/right to assure a full seat is made. If the tool has not been placed properly, the locking tabs will not be expanded and the pin cannot be removed. 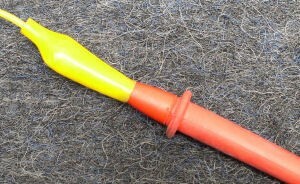 Pin extraction is completed by pushing the plunger. If the pin has a wire, a moderate pull will help to remove it fully from the plug. If no wire is present, a stick pin or paper clip from the plug front will help complete the extraction. Grabbing the base of the pin with needle nose pliers from the plug back is not recommended. If the base is deformed, it will call for rejection of the pin. 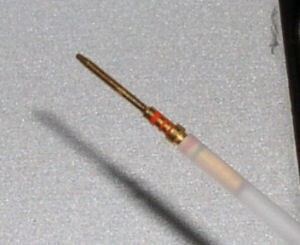 A pin is placed into the plug with an insertion tool. The tool will have a groove at the end that is designed to fit around the pin base. A small click will be felt when the pin is seated and the locking tabs engage. If the wire gauge permits, I will use the wire alone for insertion. All plugs that use letters for pin identification do not use "I" , "O", or "Q". Plugs that use numbers for identification will have parentheses "( )" around every tenth digit. Placing pins in the unused positions will help the "next guy down the line". If a pin is needed but not available in the shop, a spare can be used from the plug itself. The splice is composed of two parts, the inner barrel, and the outer sleeve. The barrel provides a solid wire to wire connection. The sleeve has sealant on both ends. When heated, the sealant flows around the wire and the sleeve body shrinks. The splice completely isolates external elements to greatly reduce the chance of failure over time. Environmental splices are manufactured by Raychem®, they require the correct crimper be used. The AD-1377 crimper is used for barrel crimping. It places a double crimp on each side of the barrel. The crimp depth is important. The tool might need adjustment; the barrel as a tendency to bend along the length if the crimp is too tight. The placement of the color stripes on the barrel and sleeve are used for a reference only. It does not matter if they are matched. A good heat gun is needed. Having a curved tip adapter is also helpful. A considerable amount of heat is needed to allow for sealant flow. 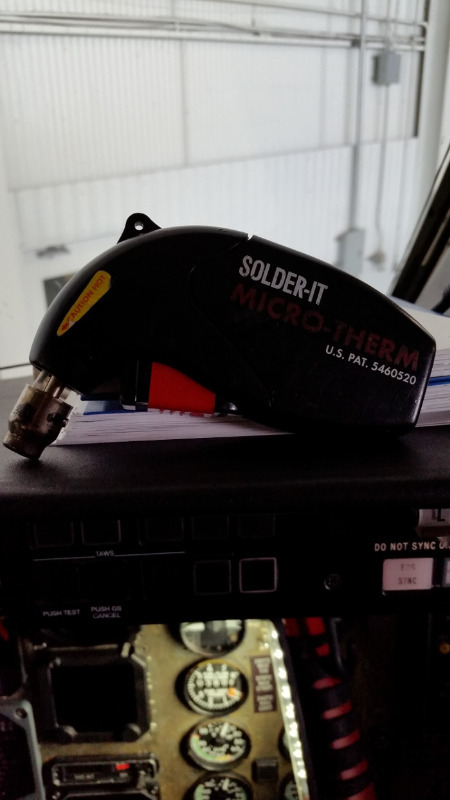 Portable heat guns normally do not have enough heat or flow. Butane torches will burn through the sleeve before sealant flow, they are not recommended. 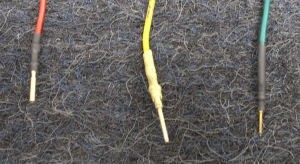 A good splice is characterized by two solid crimps on each wire and complete sleeve shrink with sealant flow on both sides. 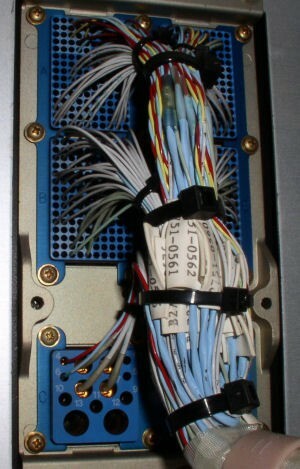 All terminals and splices are designed for double crimps. The crimp on the wire insulation provides tensile strength. The crimp on the wire itself is for electrical conductivity. To long or short of a wire strip will decrease the effectiveness of the connection. Proper placement in the crimping tool is also needed. A terminal or splice that has not been positioned correctly will most likely be bent out of shape. Crimping tool damage could also result. Once the first "click" is heard while crimping, the tool must finish the cycle before the crimp head will open. Color codes for wire gauge are standard for all aircraft usage. Yellow 10-12, Blue 14-16, and Pink/Red 18-22. The tool, terminals, and splices shown here are commonly used on aircraft manufactured in the United States. Airbus® aircraft have a slightly different style and material for their terminals. A specific tool is needed for crimping these, but a double crimp is still the result. Crimping tools will have an alignment bar for placement. Splices will have a notch that fits under this bar. Terminal lugs also go under this bar. If the terminal is positioned correctly, the bar acts as a "stop" for the wire as it is inserted. A good splice is characterized by the two crimps at the correct locations and wire visible through the inspection window at the midpoint of the splice. 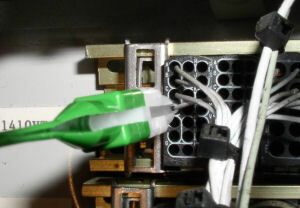 A good terminal connection will have two properly placed crimps along with the wire visible on the lug side of the terminal. Automotive crimpers and channel lock pliers are not proper for aircraft terminal or splice usage. 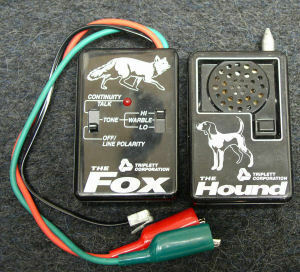 Both transmitter test leads must be used. In the case of co-ax or twisted wires, one lead would be attached to the shielding while the other is attached to the center conductor. 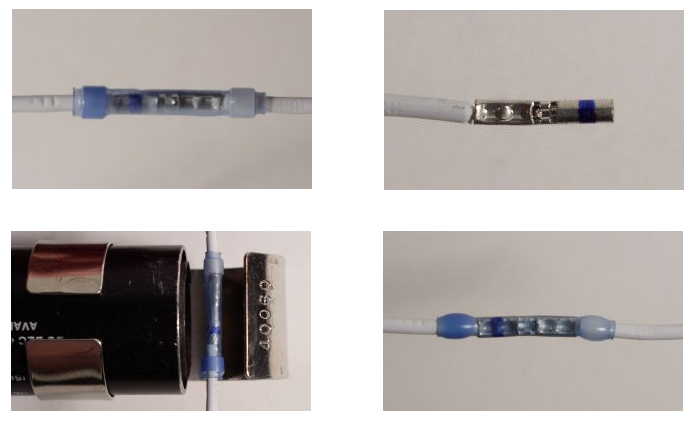 Isolation of the wire under test from components and ground connections is useful. I have found that using a tracer on one single conductor wire using aircraft ground as a reference for the other test lead is impossible. Anytime the receiver comes in proximity with structure, the tone will be heard (almost all wire runs are close to structure or ground). To use the tracer on a single wire requires using another wire that has a similar run. Both will indicate a tone. Having a bench 28 VDC power supply available for testing is still the preferred method. A buzz box can be built to apply almost any amperage. The box shown here will put approximately 1 amp across a wire. A 22 gauge or larger wire can safely handle 1 amp for testing. 24 gauge wires, which are about the smallest installed on aircraft, are mainly used for signals. Putting 1 amp across a 24 gauge wire is not a good idea. On the rare occasion where a larger wire needs to be loaded, aircraft bulbs used with 28 volt battery power are a good way to load a wire. Medium sized bulbs such as a runway turnoff or wing illumination light will put a hefty load on a 14-16 gauge wire. The buzz box or light is going to accomplish one of two things, either the wire will carry the load or it will burn through. If a wire goes open, it is easier to find and correct the problem. Aircraft voice communication radios, VHF (118.00MHz – 136.00MHz) and HF (2.0MHz – 29.9999MHz), require the transmission system to dissipate the maximum amount of the transmitted signal. No system is perfect, so there always will be a feedback of some of the signal. If this feedback is within acceptable minimum limits the VHF and HF transceivers will provide proper communication functions. When the co-ax or antenna installation as been compromised, the majority of the transmitted signal will not be radiated from the antenna. This power must go somewhere, so it will travel back down the co-ax to the R/T. The flight crew will report poor or inop transmissions. If the problem is not found and corrected, the result will be numerous R/T replacements and continued pilot write-ups. 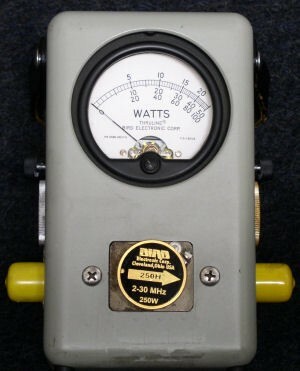 The watt meter is placed "in-line" with the co-ax run. Placing it in the system requires one or two extra co-ax jumpers and a connector adapter kit to match the jumper(s) with the different types of aircraft connectors. It also requires the correct "slug" to be installed in the meter. For VHF, the slug is usually 100MHz – 250MHz with a 25 -50 watt rating. HF slugs are 2MHz – 30MHz with a minimum of 200 watt rating. The arrow on the slug "points" down line towards the antenna for forward power and to the R/T for reverse power. 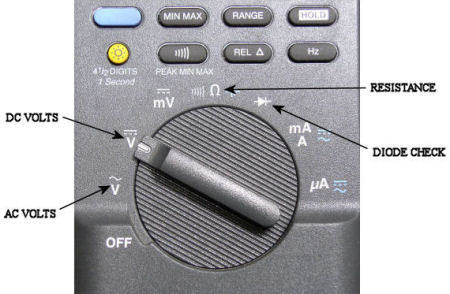 With the affected radio selected and microphone keyed, the forward or reverse power can be measured. Typical aircraft VHF radios output approximately 15 watts. HF radios transmit around 150 watts. 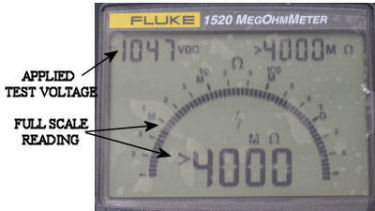 Placing the meter in-line with VHF systems can be accomplished at an intermediate plug break that is usually in the electronics compartment, or directly at the antenna. HF's might have a plug break, but the easiest insertion point is right before the coupler. The R/T rack plugs do not allow for system breakout. Meter readings are arbitrary. A working system should have the reflected signal well less than 10% of the transmitted signal. 5% or less should be considered normal. A faulty co-ax or antenna will result in a much higher reflected reading. 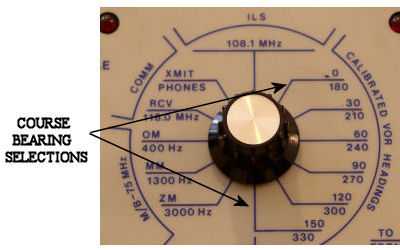 HF systems have extra components for antenna usage. The coupler is a tuning device composed of variable capacitors and inductors that "tune" the antenna for a selected frequency. 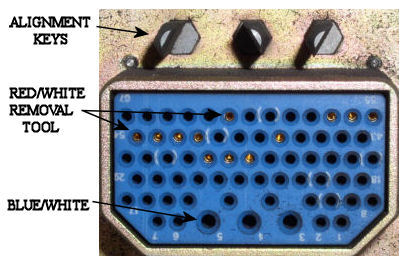 The tuning process is indicated by a tone output on the speakers immediately after the microphone as been keyed. 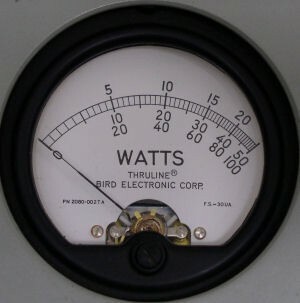 Watt meter readings should be accomplished after the tuning has completed. The system will repeat this process any time the frequency is changed. HF systems share the same antenna (not all the time). 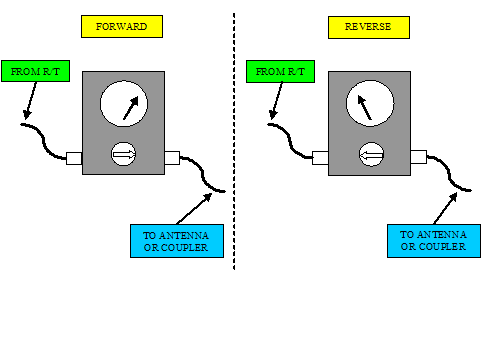 An isolation relay is used to protect (disconnect from the antenna) the unused R/T while the other is transmitting. This is accomplished at the back of the coupler rack. The watt meter cannot be used anywhere "aft" of the coupler. For ease of use, this iron works quite well. It was sold at Radio Shack©, but most if not all those stores have closed. I did find them here on Amazon. Before use, I always find a “safe” resting place for it when it is not in use. There is quite a bit of heat emitted from the forward element and it will burn anything in close proximity. Placement when actually soldering can be tricky. You can easily BBQ a finger depending on your “angle-of-attack” towards the item being soldered. For basic heat shrink work, this little torch does the job. It uses a cigarette lighter for fuel. The striking wheel and spring on the lighter must be removed to enable the heat gun to use it. I’ve found that a fresh lighter works better. Half full or less lighters tend to make you have to lay the tip very close to the shrink and at times, it can be burnt. This torch will “not” do environmental splice sleeves. It does not generate anywhere close to the amount of heat needed. I have found out (the hard way) that it will actually burn through the sleeve before the sealant even comes close to flowing. Most aircraft fuel tanks have numerous fuel quantity probes installed. The number of probes used can vary depending on tank size and system design. Most common configurations have 6-12 probes. 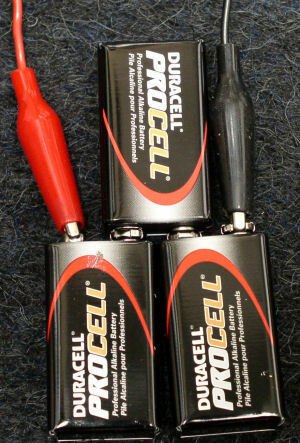 These probes are arranged in a parallel circuit. Each probe is a capacitor. The capacitance value of the probe will change with fuel level changes. The higher the fuel, the higher the capacitance. The input signal that feeds all the probes is called LoZ. The output of the probes is referred to as HiZ. 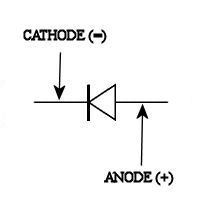 Fuel capacitance is read in picofarads or pf. Capacitance in a parallel circuit is additive. Tanks have one probe that measures fuel density. This is the Compensator Probe. The “comp” probe has a unique function, but its output is still read in pf. Fuel quantity test boxes are made by numerous manufactures. All will have similar switches and functions. The tester shown here is JcAir® “PSD60-2R. Tank capacitance checks are run with the mode selection in MEASURE EXT. 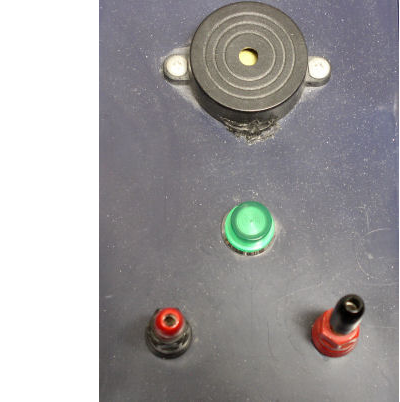 Each aircraft type usually has a breakout box with all the matching plugs to connect to either the spar plug or indicator. Breakout box connection configurations will differ for aircraft type, but all will have the same outputs for the fuel quantity tester. The co-ax connections are HiZ, LoZ, and Comp (numerous breakouts have only HiZ and LoZ, the Comp is included with the rotary switch selections). If the test setup is connected at the indicator, only total tank and compensator readings can be made. If the breakout box is connected at the spar plug, each individual probe can be measured along with total tank readings. Tank or probe readings can be done with meter test leads, but the hookup requires having the correct spar pin-outs. Using the proper breakout box is still the preferred method. The fuel quantity unit’s TANK UNIT co-ax (BNC) connections are differentiated by gender. LoZ and Comp are male pins. This reduces the chances of incorrect setup (if the LoZ and Comp are swapped, you’ll know it). 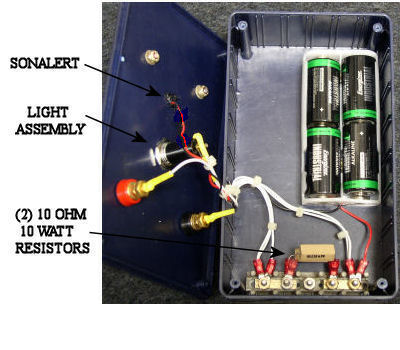 Tank or probe capacitance readings will not be correct if the ground leads from the fuel quantity tester to the breakout box and from the breakout box to aircraft structure are not connected. All tank and probe readings need to be made with the tank completely empty. Some tanks will require sumping. The Comp probe is located at the lowest point, if it is still sitting in fuel, the capacitance reading will be high. Total tank and probe capacitance values can be found in the aircraft's Maintenance Manual. A major function of the fuel quantity unit is measuring insulation resistance or a “Meg Check”. Different combinations of shorts can be detected. Minimum values for meg check readings will also be found in the M.M. 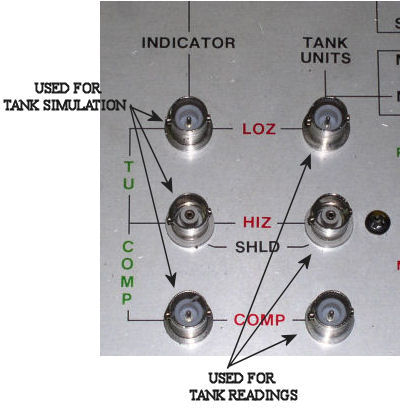 Simulation of tank values is used for troubleshooting of indication systems. 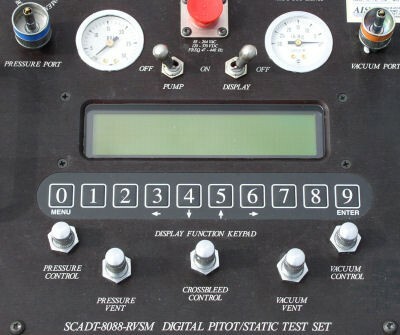 It is also used for calibration of some types of fuel systems. For calibration purposes, the simulated value is used along with the tank to adjust the “full” value of stand alone indicators. Tank simulation is a two step process. 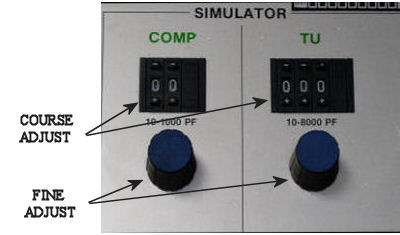 The simulation values need to be set up first and then the box switched to simulate mode. 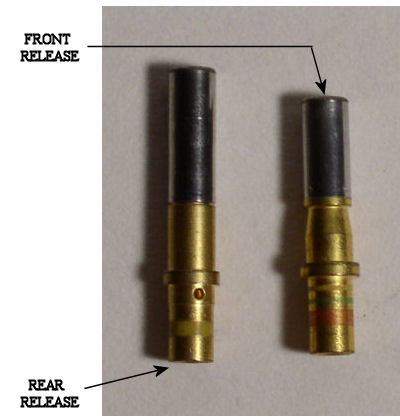 All simulations use the INDICATOR co-ax plugs. LoZ, HiZ, and Comp require correct connections. Simulation values are set with the mode select switch in MEASURE INT. Tank unit and comp values are dialed in with the course and fine settings of the tester. The thumb-wheel indication does not match actual values. The display should be monitored when setting both tank and comp. After the values have been set, the select switch is placed in SIM TU & COMP. The unit will output the dialed in values and the screen will show dashes or eights. Fuel quantity indication problems can be located anywhere in the system. I will exhaust ALL avenues before opening up a fuel tank for troubleshooting. Been there, don’t want to go back. Only a bad probe reading or failed meg check from the spar plug would be cause for accessing the tank. Meg checks usually verify problems with the tank harness. Fuel can migrate into an older harness and cause shorts in the wires. Probes rarely, if ever short out. It is not unusual to have probe readings that are slightly (+/- 5pf) out of M.M. tolerances. These reading are normally on the high side. When a tank is drained of fuel, some will remain on the walls of the probes. Simulation of tank fuel quantity from the spar plug to the aircraft is useful for troubleshooting non-tank related problems. Empty tank simulation can be easily accomplished. If “fuel on probes” simulation is needed, I use the opposite wing tank values for HiZ and Comp. Simulating these values for whatever fuel level needed must be correct. The Comp, once it is wet will stay the same for all quantities. The HiZ will vary with fuel level. If either is not simulated correctly the aircraft fuel indication will most likely show an error. 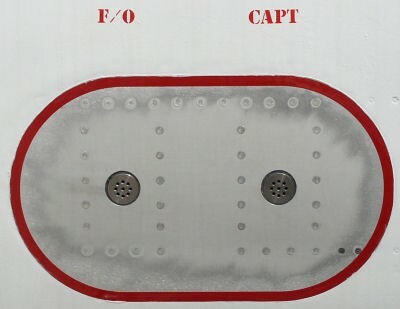 Newer generation aircraft send tank quantity signals to a central Fuel Quantity Computer. Each tank quantity is calculated and sent out via 429 data bus to all the systems requiring quantity information (EFIS, FCC, TRC …etc). Douglas products incorporate a junction probe that can be accessed from the top of the wing for isolation of probe or harness problems. 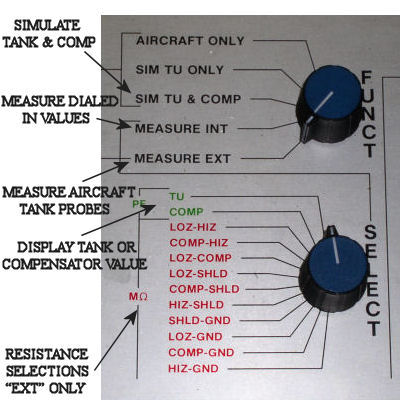 MD-11’s or any other aircraft that allows making one tank probe inoperative from CFDS use a different type of quantity computation. They do not add capacitance. All probes are monitored individually. A modified average value is taken for quantity calculation. Loosing one probe will make the system less accurate, but a reliable quantity is still available. The ABSOLUTE first step before using a megger is to verify per the wiring prints that ALL associated components have been isolated from the wire under test. Neither analog nor digital circuitry enjoy 250-1000 VDC being thrown at it and most components will not survive a hit from a megger. One very important note: Never use a megger to verify a “in tank” fuel quantity harness problem. Digital meggers do not require any adjustment to use. 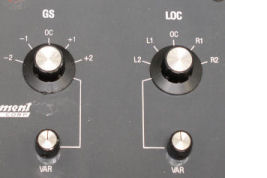 Older analog units have an open lead (tests leads not connected) full scale adjustment. Adjust this to maximum or infinity (∞) before use. 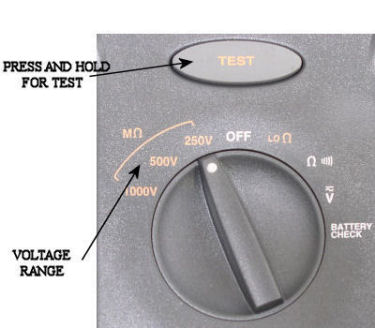 This adjustment will change with the different test voltages. I like to start at the lower voltage settings to check wires. A megger will supply a high voltage potential, but very little current, it is still good practice to start low and then move higher if needed. A good check indicates as close to maximum (∞) as possible. Wire shorts can occur anywhere throughout an aircraft. I have found that most are outside the pressure vessel, in high vibration areas. Wings, pylons, and the horizontal stabilizer areas are prone to wiring problems. A megger will show that there IS a problem. Finding it can be difficult at times. Isolation by eliminating wire sections is good practice. If possible, narrow the area down to between two plugs with no other connections inline. Some shorts require two people for troubleshooting, one to watch the megger and one to shake down the suspect area. Watch where your fingers are. Most people do not forget a megger blast. The switch should be considered basically as a relay, but one that has to be manually switched on. 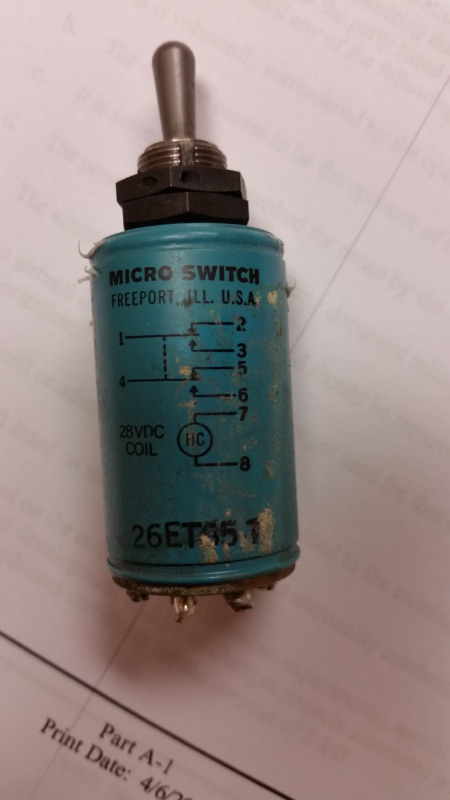 Internally, there is a holding coil used to maintain the switch in the "on" position. Voltage to this coil is present when a "valid" signal is output from the controlling circuit. A manually engaged Yaw Damp System switch. 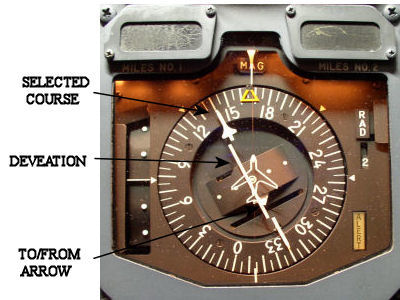 When the crew flips the switch on, it will remain on as long as the valid signal from the controlling computer (Stab Aug on many older aircraft) is present. If for any reason (let's say a rate gyro takes a dump), the computer and/or system is no longer usable. The valid signal is removed and the switch falls to the off position. The valid that maintains the switch on can be either voltage or a ground. Coils don't care. As long as both are present the coil stays energized. Removing either the power or ground will de-energize the coil and the switch will fall off. Testing the ILS system is accomplished with the VOR/ILS test box. Many different varieties of test units are used today. The basic functionality of them is the same. Most units use 108.10 MHz as a standard test frequency. This is actually the localizer frequency, but a matched glideslope output is also transmitted. Tuning the aircraft's navigation control to 108.10 will place the receiver in ILS mode. 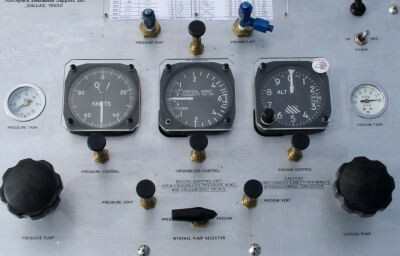 If an aircraft is equipped with dual systems, placing both controls to 108.10 is helpful as a comparison of indications. Newer generation aircraft do not have a navigation control. Tuning of the navigation receivers is accomplished by the Flight Management System. Manual tuning is possible from the FMS control head. 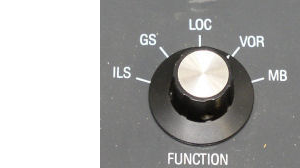 Honeywell FMS's have a line select key labeled NAV/RAD for inputting frequency and radial. Select ILS on the test box. If the proper output is received, both the localizer and glideslope flags should pull out of view. Most testers allow for separate control of localizer and glideslope signals or both can be driven simultaneously. 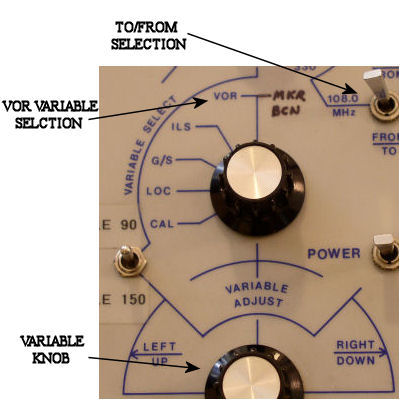 Full scale defections of either needle should be noted when the variable knob of the tester is used. 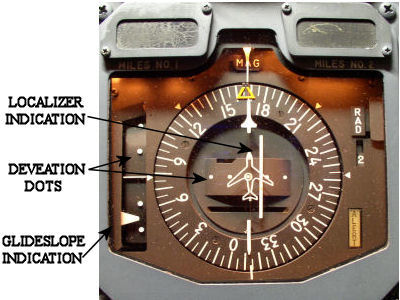 ILS indication or specifically the localizer does not care about compass heading. 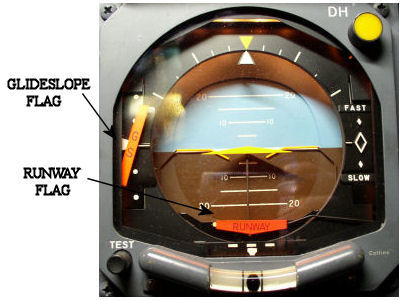 The course knob is usually set at runway heading by the flight crew or straight up when maintenance is using the tester, but if the course was placed right/left of centerline the indication would still be the same. Localizer deviation dots usually represent 1¼ degrees each for off centerline. Glideslope dots represent 0.7 degrees each. Most aircraft installations crisscross ILS information. The captain’s ADI and F/O’s HSI showing #2 nav information. The captain’s HSI and F/O’s ADI showing #1 nav information. Comparisons between systems should always be used if two are installed. 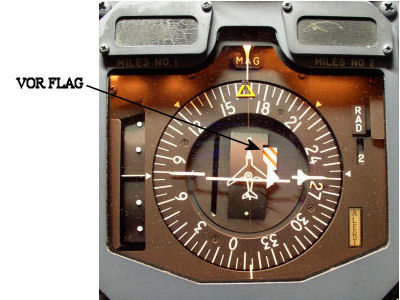 The “Rising Runway” installed on some ADI’s is a dual indicator. Localizer left and right, with the dots representing 1¼ degrees. The vertical section is radio altitude, with full up representing "on the ground". Typical installations on aircraft have the glideslope antennas on the nose gear, nose gear doors, or mounted on the forward side of the pressure bulkhead. The localizer antennas (dual antenna for VOR and LOC) mounted on or near the vertical stabilizer. Getting the localizer flag to pull and driving the indication is difficult on larger aircraft with some testers. Opening a window and placing the test antenna outside helps, do not let it contact aircraft skin. VOR/ILS testers do not usually survive a fall from the window; some do not rest correctly on the window frame. 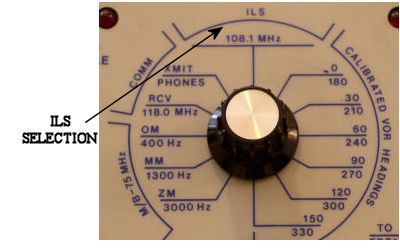 The TIC30 VOR/ILS tester along with a few others allow for attenuation (decreasing) of the transmitted signal. This is very helpful when troubleshooting antenna or co-ax problems. 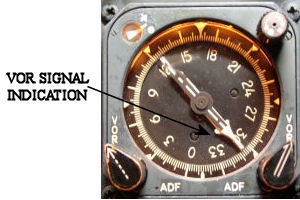 Older aircraft with RMI’s that have the needles selected to NAV should “park” them at the 3 o’clock position when the navigation systems are tuned to any ILS frequency. This is a function of the navigation receiver. 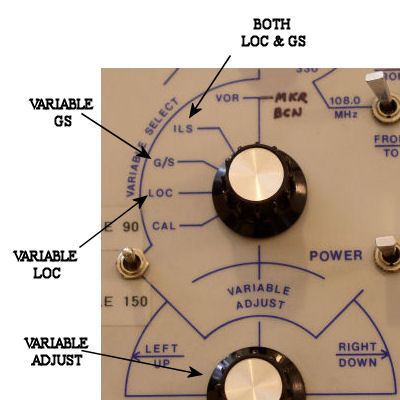 Testing of a VOR system is similar to ILS. Both use the HSI deviation bar as indication. Unlike ILS, VOR is referenced to compass input. One of 360 course selections can be dialed in. Each dot represents 5 degrees when the deviation bar is off center. Most RMI's are equipped with VOR/ADF needles. When selected to VOR, these needles will point TO the tuned VOR station. The standard VOR test box signal is 108.00 MHz. The variable function allows for simulation of all 360 radials. As an example: with the test unit simulating 140 degrees, numerous results should be observed. With the HSI course selected to 140, the deviation bar should be centered and the to/from arrow pointing the direction of the selected course. The GS Indicator should be "biased out of view" and both the VOR/LOC or GS flags should be pulled. 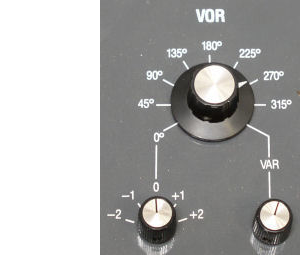 The variable knob can be used to move the deviation bar left and right of center. Flipping the to/from switch will cause the to/from arrow in the HSI to point opposite the selected course. 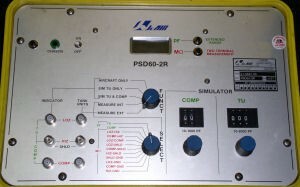 Comparison of systems is always recommended on aircraft equipped with dual systems. On most aircraft installations the VOR and LOC antennas are the same component usually located on the tail. Pulling the VOR flag and driving the indication can be difficult without the test box antenna outside a cockpit window. VOR indication is referenced to compass heading. It is not unusual to see a RMI needle split when testing two systems at once. Analog compass systems are rarely matched on the ground. This is not normally seen when IRS’s are the primary compass source. 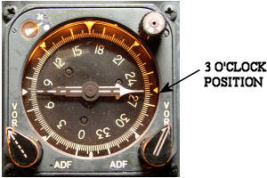 “Walking” the RMI needle around the compass in 30-45 degree increments is a good practice. Bad indications can occur in one compass quadrant while showing good in another. Verification of the HSI course deviation bar in all four compass quadrants is also a good practice. 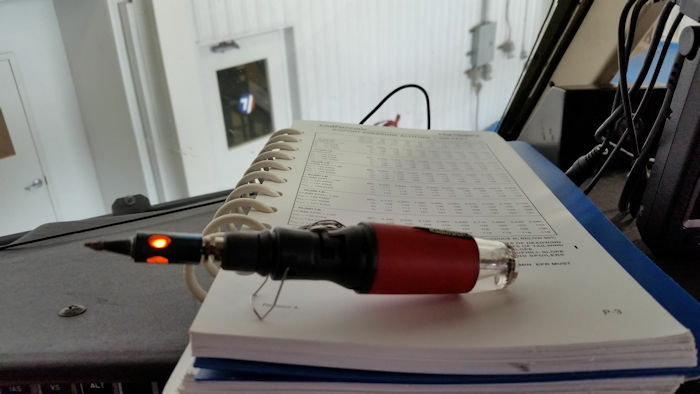 I tend not to trust the newer "totally automatic" pitot/static testers. I have seen "run-a ways" by these testers not being operated correctly. I still prefer the manually operated RVSM digital testers to the automatics. The last time I checked, air data components were mighty expensive to replace. The boss man always enjoys it when he is told a unit got smoked. If you're not totally familiar with an automatic test unit, don't use it. It should be noted when accomplishing altitude checks that the airspeed indicator Vmo needle will drop as the static system is driven higher. This is proper; overspeed indication is a function of altitude. Springtime is noted for mud dauber wasp nests in pitot system lines. The usual result of this is an aborted takeoff for airspeed splits. If blockage is suspected, tie into both pitot systems. 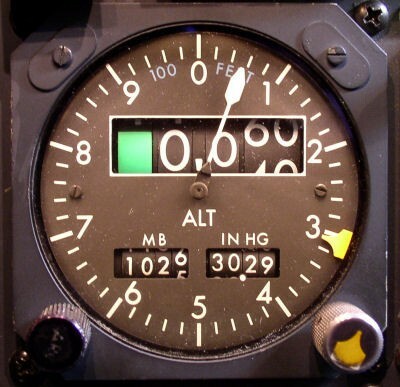 While watching the airspeed indicators in the cockpit, apply pressure to simulate a quick airspeed climb, if one is slower to increase, it is almost guarantied blockage is present. After the blockage is cleared with wire, blow outboard from the air data or airspeed indicator with nitrogen. Verify no other component is connected to that pitot system before hitting the system with regulated bottle pressure. I would never exceed 50PSI for clearing lines, if the blockage is still present while using higher pressures, a line will split open and require changing. Pitot/Static tester control valves use nylon seats. It is a good practice to open all the valves after tests have been run. This will keep the seats from warping. Trying to control the tester with leaking valves is very difficult. Opening the valves will also drain the tanks and provide for safe transportation if the unit is to be shipped on an aircraft. ]]> Pitot Static Box Sun, 16 Apr 2017 21:48:34 +0000 Static - Altimeter Checks - by: Mark https://rotate.aero/forum/ps-altimeter/197-static-altimeter-checks#310 https://rotate.aero/forum/ps-altimeter/197-static-altimeter-checks#310 Airspeed is a function of both pitot and static. If a vacuum is not bled over to the pitot side when performing altimeter checks the airspeed indicator will most likely be pegged out high around 5000' above field level. With the crossbleed valve open the airspeed indicator will remain at 0 knots and the aircraft can be taken to service altitude without fear of damaging the airspeed system. The IVSI control valve should also be left open. 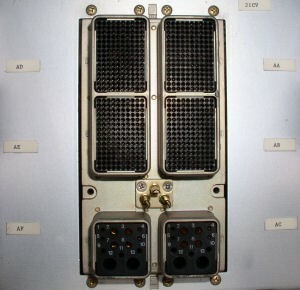 The IVSI is used to verify altitude rate of change. As a general rule, never exceed 6000' a minute going up or down. Close all other valves before starting. Charge the vacuum tank with the electric pump if it is available. Leave the pump running, it will be needed. Unlike the pitot system, the static takes a considerable amount of suction to reach higher altitudes. Hand pumping a system to 35K is not fun. Slowly begin to open the static control valve. 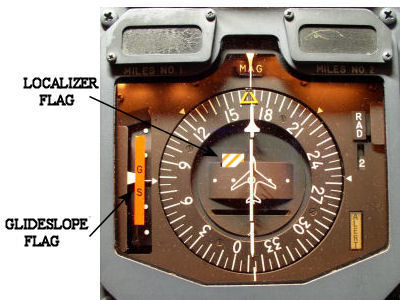 The altimeter can be driven to the desired value. The higher altitudes require opening the control valve more on the way up. Keep the IVSI within the 6000’ rate. Verify the airspeed indicator remains at 0 knots. Watch your hoses. Anyone stepping on or tripping over a hose might make it fall off the test port. 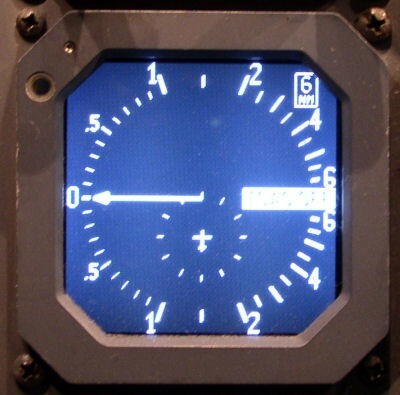 If an airspeed indicator gets pissed from being driven to fast, an altimeter or air data computer will go into a rage if it is dropped from 40K to 0 all at once. Keep in mind that both pitot and static are being evacuated. If a small leak is noted in the 35K+ range it is most likely with the test connections or the tape on the opposite side static port. Newer aircraft that have the static port incorporated in the side of the pitot probe do not usually have this problem. I have found that static and pitot test adapters from Nav-Aids® provide a very tight connection. The system can be lowered by slowly opening the static vent valve. Again, do not exceed the 6000’ rate. When I use the tester for troubleshooting or functional checks, I like to have the unit in the cockpit while tests are run. This sometimes involves having numerous test hose segments to reach the static port, but direct observation of aircraft indications is preferred for comparison. I also like to verify that my test box inputs are not exceeding the component limits. Digital equipment on newer aircraft is much more forgiving than older analog components that use mechanical bellows for measurement. I still practice techniques that would be used on analog components regardless of what is installed. 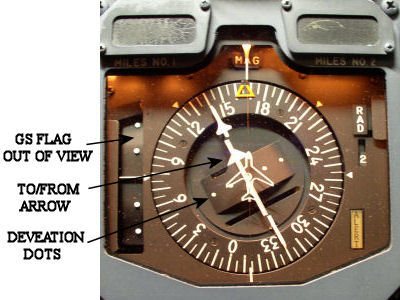 Airspeed indication is derived from both pitot (pressure) and static inputs. If there is no difference between pitot and static pressures, airspeed will remain at 0 knots. I like to perform checks in two steps. Pitot first, followed by static. 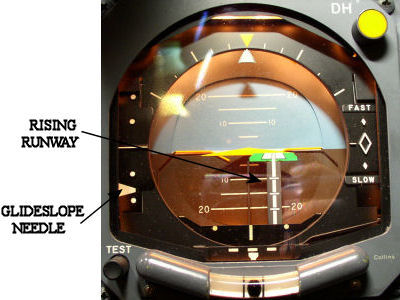 This simplifies the difficulty of trying to keep the airspeed in limits while the aircraft is at altitude. 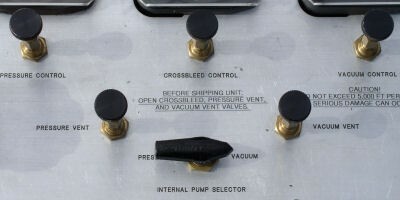 The crossbleed valve enables an aircraft system to be driven to all operational altitudes without concern about airspeed exceedance. Troubleshooting aircraft systems requires access to plug and rack pins. Having a set of different size test leads is essential. Safety wire is not a practical tool for testing circuits. 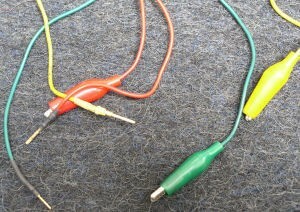 I use test leads that I made from Amazon alligator clip jumper wires . I cut them in half and crimped various size pins on them. I use heat shrink tubing to protect all but the working end of the pin. I ground down the tips of my meter test leads about ¼" to accommodate the alligator clips. When I hook up to the meter lead, I push the rubber of the clip over the plastic of the lead. This prevents inadvertent grounding of the alligator clip on metal. It's always nice to see that split second of flash and spark, then be left wondering what you just fried. I like to have at least two each male and female sizes in the red (20) and blue (16) gauge pins. 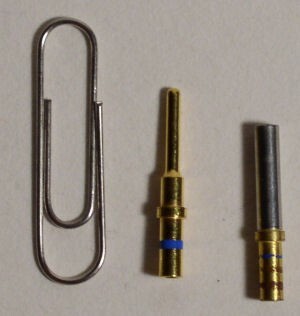 Digital computers use smaller pins in the 24-26 gauge range. The males in this range are easier to obtain because the rack plugs use them. The females are not easy to find, they are on the computer (LRU) plugs. The component shops have them, but line mechanics do not normally have access to these. The problem is, the females are needed to get into the rack pins for troubleshooting. If you find any females in this smaller size, take care of them. If a plug with bent male pins is found, try using a female pin to straighten them out. It is a lot easier than a screwdriver or needle nose pliers. Diodes are solid state devices used extensively throughout aircraft avionics and electrical systems. They are basically a "check valve" for electrical current, allowing flow in one direction only. To verify the condition of a diode, one leg should be isolated from the system. Having the test leads in the forward bias position the meter will read the voltage drop across the diode (the meter displays "V" instead of "Ω"). Typical indication is from .5 to .6 volts. With the leads swapped, the meter will read open. The easiest way to remember the bias, the diode "points" to ground or negative. The diode will have a white band on the negative side. Some sensors installed on aircraft have diodes installed in "series" with resistors. Fuel level sensors are an example. When checking these from the fuel level amp, the meter will have to be selected to diode check to verify proper continuity of this type of sensor. There have been many times that I have been continuity checking wires only to have the resistance reading jumping around in the 1MΩ range. If this is noticed, flip the meter to diode check to verify if one is in the system. 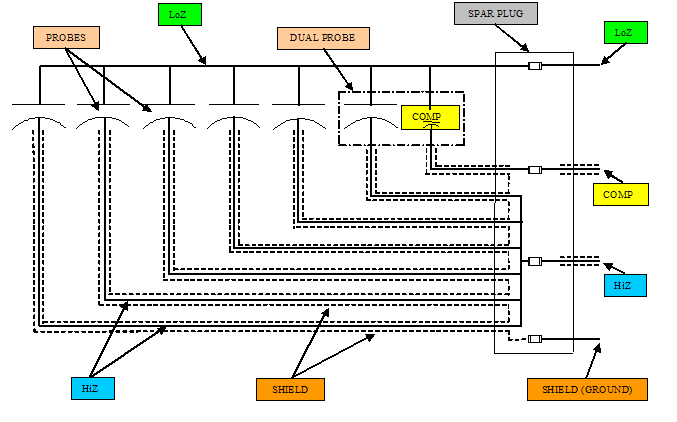 Schematic diagrams often omit showing diodes that are installed. 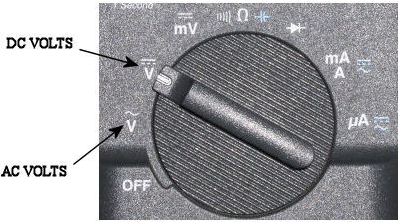 Particular attention to the Ω symbol when shooting electrical components is needed. 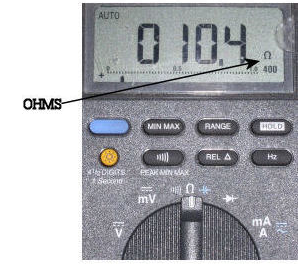 The biggest mistake while using a meter is not observing the Ω, KΩ, MΩ indication. 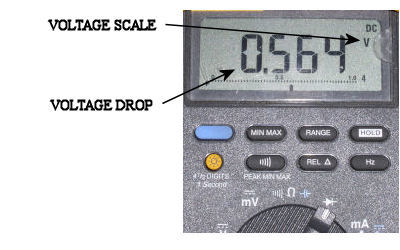 The display of .562 does not always represent ½ ohm, although I have noted this mistake many times. 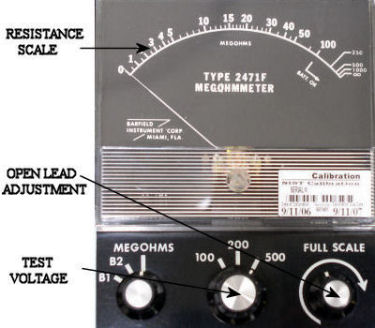 More than likely the meter is indicating .562KΩ or .562MΩ which is significantly higher than ½ ohm. The two readings above are 562 ohms and 562 thousand ohms, respectively. Continuity checking a wire from the tail area to the E/E compartment of a 747 for example, can read numerous indications depending on wire condition. I tend not to get to excited about 25Ω or less. This would be a long run compared to most aircraft. The most common problem I have experienced while shooting a wire using ground as a reference, is the ground itself. Using a poor ground connection on either end can give a bad indication for a wire that is likely good. I tend not to use the buzzer function of the meter for wire checking as verification of a good wire. Direct observation of the meter reading is recommended. Standard checks are basically verification of power being present or not. Heavy duty components such as pumps and electric actuators use 3 phase power. One phase missing or having low voltage will cause failures of these devices. Numerous electrical and avionics related components require 115 VAC as a primary power source. Signal voltage standard is 26 VAC. Sensors and transducers modify this voltage in relationship to their position or angle as feedback to associated computers/indicators. 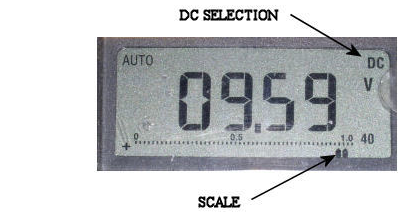 5 VAC is a typical voltage for instrument and panel backlighting. Some external lights use 10 VAC for power. Step-down transformers are used to change 115 VAC to the lesser voltages. 28 VDC is used for both power and control functions. Transformer rectifiers are used as a power source on AC generator aircraft. Some aircraft have DC as primary power coming directly from engine driven generators. The majority of relays and solenoids use 28 VDC. Most systems use 115 VAC for power applications. Step-down transformers reduce this voltage to 26 VAC for signal voltage and 5 VAC for instrument or panel background lighting. 28 VDC is the standard direct current voltage. 28 VDC is commonly used for relay control, solenoids, and indication lights. The resistance function is used for continuity certification of wiring. Internal component measurements are also checked with the resistance function. 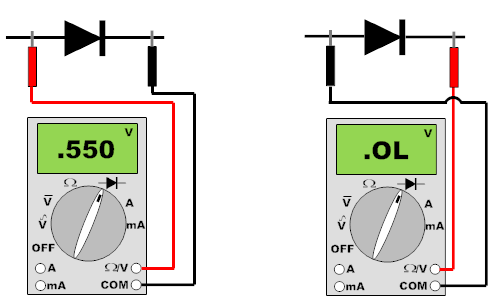 Proper diode functions are verified with the diode check selection of the VOM. I usually like to leave a meter in "AUTO" mode for any checks that I am accomplishing. In auto it will indicate correctly no matter what the voltage or resistance might be. If you are using manual, the range must be proper for the system under test. 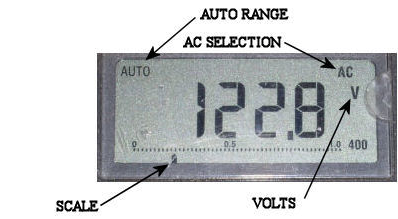 Very often an "OL" is displayed when the meter is not in the correct range. Having a meter with a backlit display is very helpful. More often than not, you can find yourself jammed in a hole with both hands busy holding test leads. Holding a flashlight in your mouth or having someone else to assist you is not needed.